Over the past few years I’ve come to appreciate the Salesforce Foundation’s Nonprofit Starter Pack (NPSP). But I have to admit, I’m not a fan of the Foundation’s Batch Data Entry tool. The interface is clunky and it doesn’t proactively allow you to create donor records on the fly or apply payments to an existing opportunity record. It was released in 2011 and hasn’t appeared to get a lot of love since. It’s not mentioned on the main Starter Pack page or in the documentation. While Common Ground’s batch tool was far from perfect, a lot of organizations used it and relied on it. At KELL Partners, we couldn’t migrate them to a NPSP-based solution without a decent batch gift entry solution. It’s not just uploading Opportunity records via the Data Loader or DemandTools. You have to match those gifts to existing donors or create new ones if they don’t exist. You have to make sure those gifts aren’t already attached to pledges. And you have to know enough about your data to map the field name and values correctly. We thought about developing our own utility that ran in the Salesforce UI (like the NPSP batch tool or Common Ground’s). We considered developing a stand alone tool (like DemandTools). And then the light bulb went off. Apsona! Apsona already had a UI starting point. It’s all about manipulating data. It runs separately inside of Salesforce but is not a separate download. And there aren’t enough words to say how highly we regard Apsona’s leadership, Sridhar and Sadna. We knew they’d be a pleasure to work with (and they were!). We approached Sridhar and Sadna in late January/early February with the idea of developing a batch gift entry tool together. They agreed without hesitation and here’s the result! We spoke to many of our clients and evaluated how batches are entered in many different applications, in and out of Salesforce. I’m very proud of this collaboration. This initial release came out even better than I imagined it. This is not an all purpose to-any-object bulk entry tool. You can already use Apsona for that purpose. This tool is for the person who works at a nonprofit and has a pile of checks on his/her desk that have to be entered in Salesforce. First, you add a new batch record. 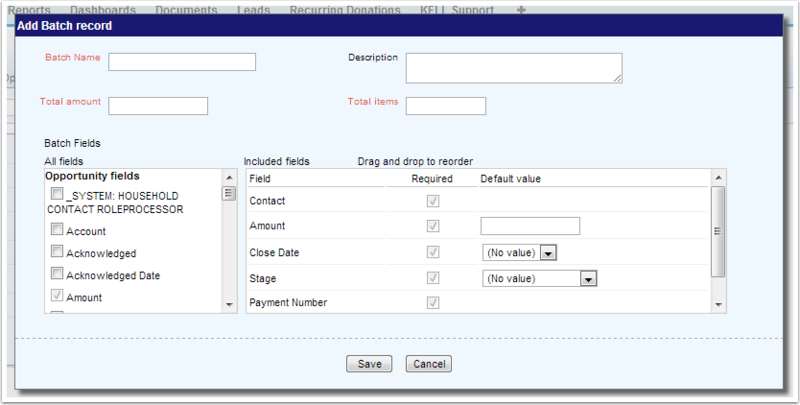 This defines the parameters for the batch (total amount and items), custom fields, field defaults, etc. You can select any field from Opportunity and Payment objects to include in your batch, including Lookup relationship fields (this was a huge shortcoming of the Common Ground batch tool). At this point you can’t create batch templates, but you can clone an existing batch record so you don’t have to reset the fields each time. When the batch record is set, you start to Add Entries. Type in any part of a contact’s name and it will show matches to select. This automatically selects the contact’s account as the Account for the gift. The tool is primarily designed for individual donor gifts, but could be adapted for organization gifts depending on how rollups are set up and the fields that are added in the batch. Once you’ve matched a contact, you can search for an outstanding payment to apply the gift against. It will look for any opportunity with a probability of 50% or greater with unpaid payments. If a contact is not matched in the database, you can create a new contact. 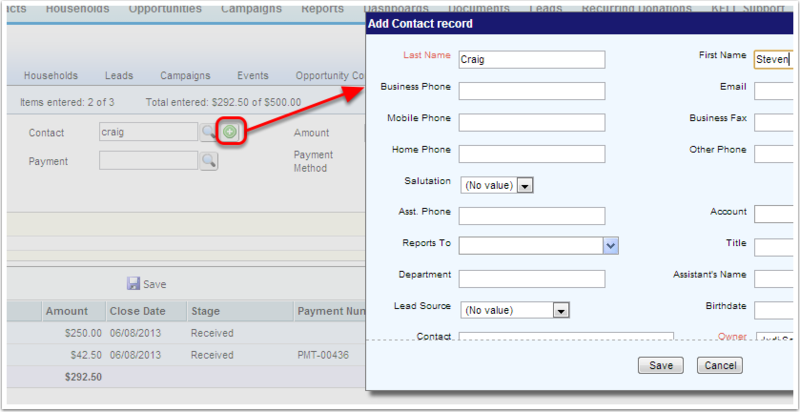 The fields on the Add Contact record screen are also entirely customizable with an organization’s own preferred fields. If you realize you made a mistake in a previous entry, you can edit it right in place and save. No transactions/payments are created in Salesforce until you commit the entire batch. That way, you can start a batch entry record, stop after 30 of 50 checks and go back to it later where you left off. Once you commit a batch, it’s locked to further editing and the batch details are attached to the created payment record. Now you can run reports based on batch entries and export what you need for reconciliation. Right now, you can’t add contact roles for soft credit. Household soft credit will be applied according to NPSP settings. If you need to add additional soft credits, you’ll need to do it after the batch is committed. Pricing for the Apsona batch gift entry tool starts at $720/year ($144/user with 5 user minimum). More than worth the time it will save. Apsona is hosting a webinar to demo it on June 18. What do you think? Did we miss anything?